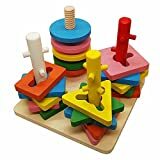 • The wooden colorful stack & sort puzzle toys teaches shape and colour and pattern recognition ,and early geometry through Play , can be used as early preschool ecucation tools in montessori school ,home schooling, or early childhood development . • Toy set is with wooden base, pegged stacking rings , and with the building blocks of all sorts of different models . Perfect for nurturing toddlers’ patience and concentration . • Wooden puzzle colored with certified non toxic, water-based stains , not plastic, ; finished in bright colours, made from hard-wearing wood ,buy with confidence! • Helps children develop hand-eye coordination and logical thinking ,endless learning possibilities (learn shapes, colors, numbers, even imaginative ) while playing with the shape matching game . • Suitable for babies from 18 months ,perfect christmas gift for your kids . Let your child enjoy the world of shape and color! This multi-tasking sorter encourages counting, sorting, and increasing complex color identification, a good preschool learning toys for a gifts . 1 ,The colorful stack & sort puzzle toys with a wooden base, and different shapes to put on the pegs. 2, Made from hard-wearing wood and finished in bright colours. 3, Fine wood multi-colour and shapes puzzle blocks can be taken on and off the pegs by twisting and screwing . —1) The stacking & sorting puzzle helps to train children for problem solving, lateral thinking, patience and concentration while learning colours, shapes and having fun. —2) The recognizing geometric board introduces logic, matching, spatial relationships, delvelops critical thinking, and helps understand the cause and effect relations. Promotes dexterity, and building kid’s cognitive ability, cultivate baby’s eye and hand coordination ability, train babies’ fingers muscle flexibility. 5, The recognition blocks toy is made of high quality wood, not plastic, water-basied paint , buy with confidence! 6, No asembly as the sorter comes assembled. . 7, Suitable for babies from 18 months. LA Muscle Look Like Zoran Ultimate Muscle Building Stack Save £296: 8 High Performing Pharma Grade Supplements To Build Muscle & Loose Fat Get Big, Get Muscular. You will see the Difference or Your Money back. Amazon Special Order Now before it’s too late!! RRP £395 Buy Now Before Prices Go Up!! !